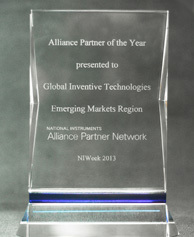 Global Inventive Technologies Intl Inc.
Today, the National Instruments Alliance Partner Network welcomed hundreds of Alliance Partners to Alliance Day 2013. The event is reserved exclusively for NI Alliance Partners and the NI sales team for collaboration, NI product and technology updates, business best practice sharing, and networking opportunities. In addition, the LabVIEW Tools Network Awards recognized the top achievements in add-on software and hardware. Five companies received product of the year awards for LabVIEW add-on development in automated test, embedded control and monitoring, data acquisition, LabVIEW innovation, and community (free downloads). Automated Test – Tool Qualification Kit for NI TestStand, CertTech, L.L.C. Community – TSVN Toolkit, Viewpoint Systems, Inc.
System integration and consultant companies in the program were honored in three categories for the business value they provide customers based on NI technology and graphical system design. Platinum Level – Cal-Bay Systems, Inc.
Four companies were selected by NI Sales leadership for the Regional Partner of the Year awards as overall examples of our mutual investments and business relationships. "On Alliance Day, we show our Alliance Partners how we have re-energized our Alliance program as well as give them a vast array of training," said Tony Vento, vice president of Systems Assurance and the Alliance Partner Network. "Alliance Day also offers our Alliance Partners the chance to showcase their expertise and collaboration with NI." For more information about the system, please visit this link. Copyright © 2014 GLOBALINVENTIVE TECHNOLOGIES. Web design by xantec solutions.